Barry C. Black is a retired U.S. Navy Rear Admiral. On June 27, 2003, he became the first African American Chaplain of the United States Senate. Black was born on November 1, 1948, in Baltimore, Maryland. At an early age, his parents—his father Lester and especially his mother Pearline—insisted on the importance of education and religion. Brought up in a family of Seventh-Day Adventists, he developed a passion for language and speech at a young age and thrived in his religious community. Black received a theology bachelor’s degree in 1970 from Oakwood College, a black Seventh-Day Adventist College in Huntsville, Alabama. He then pursued a masters of divinity from Andrews Theological Seminary in 1973 in Michigan. Black pastored in several churches in North Carolina and South Carolina before obtaining a Master’s degree in counseling from North Carolina Central University in 1978. Black also successfully pursued a doctorate in theology in 1982 at Eastern Baptist Seminary, a master’s degree in management in 1989 at Salve Regina University, and a second doctorate in psychology at United States International University in 1996. He married Brenda Pearsall in 1973, whom he met in Oakwood College. The couple had three children: Barry II, Brendan, and Bradford. The navy was in search of African American chaplains in the 1970s, and Rev. Black enrolled as a chaplain in 1976. As soon as he started his new job, he knew it was his calling; he enjoyed working with young people, athletic activities, traveling, teaching, and leadership. 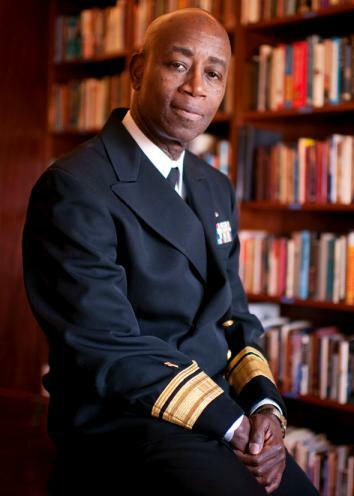 He became Deputy Chief of Chaplains in 1997, and Chief of Navy Chaplains in 2000. He was also promoted to Rear Admiral in 2000. Overall, Black served in the navy for 27 years, retiring in 2003. Among other decorations, he received the Navy Distinguished Service Medal, the Legion of Merit Medal, Defense Meritorious Service Medal, Meritorious Service Medals, Navy and Marine Corps Commendation Medals. Black was appointed Chaplain of the United States Senate on June 27, 2003, becoming the 62nd in his position, and the first African American Chaplain of that Chamber. Among other things, his role consists of opening up each of session of Senate with a prayer, as well as providing pastoral services and counseling for the members of Senate, their families and employees. He also plays a role in international religious affairs and welcomes guest chaplains of diverse religions in the Senate. "Barry C. Black Biography - Studied Bible and Oratory, Heeded His Calling, Found His Place and Mission, Appointed to Top Posts", Brief Biography, http://biography.jrank.org/pages/2332/Black-Barry-C.html; "Chaplain Barry C. Black," United States Senate, https://www.senate.gov/reference/common/person/barry_black.htm. “Barry C. Black Biography – Studied Bible and Oratory, Heeded His Calling, Found His Place and Mission, Appointed to Top Posts”, Brief Biography, http://biography.jrank.org/pages/2332/Black-Barry-C.html; “Chaplain Barry C. Black,” United States Senate, https://www.senate.gov/reference/common/person/barry_black.htm.